The Global-Local Education Research Center reports in academic year 2010 on: 1) Increase in the number of students completing the Center program mainly due to a revamped minor program, 2) Issue of Center News and other materials , 3) Preparation for a graduate-level minor program. First, thanks to the expanded minor program (local hands-on practice) the number of students completing the Center program hiked to 28, and the College of Education and Human Sciences turned out 10 students who completed the requirements, indicating that all Colleges were evenly represented among the completed students. See the voices of the students (http://www.chiki-ct.ynu.ac.jp/). Note that many students were involved in the engineering-related disciplines. The Center has upgraded the quality of informational media it publishes through unifying the design, and expanded the contents of its website as touched on above. 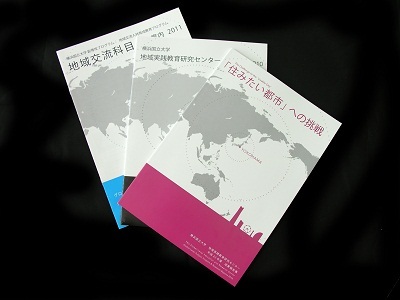 Center’s print media include 1) Center News, 2) Guide to Local Exchange Courses, 3) Progress Report and 4) Annual Report, of which 2), 3) and 4), which are published annually, have reduced amounts of information, use higher selection criteria and have a unified design – for the sake of “easy recognition and readability.” The covers are also designed to be immediately recognizable as our publication (photo). Also noteworthy for AY2010 was the topic of the blueprint for graduate-level minor programs. In AY2010 the Graduate School of Urban Innovation and Faculty of Urban Innovation were established in parallel, and the decision was made for many of the staff (teaching and otherwise) that are related to Global-Local Education Research Center to be moved to the new Graduate School as of AY2011. In anticipation of Center’s participation in “studio education” in the new graduate school, Global-Local Education & Research Center is requesting its own budget for it, too. As reorganization of International Graduate School of Social Sciences is under consideration for AY2011, our plan for the same academic year is to position the graduate-level minor program appropriately given this trend and build a system that takes into consideration the prospect of taking over those students who, after finishing the undergraduate minor program, decide to continue onto the graduate school.